For a democratic secular Iran. For peace and prosperity in the Middle East. : So What if People Don't Eat Chicken? It is attributed to Marie Antoinette that when she was told people in France don't have bread to eat, she had replied 'Let them eat cake' but I am told there is no evidence she ever said that and the phrase has now become a cliche. Today a new cliche 'so what if they can't eat chicken?' must replace 'Let them eat cake'. This new masterpiece of a cliche was uttered today by Ayatollah Makrem Shirazi during his sermon in Qom. Posterity will not be able to argue, as in the case of Marie Antoinette, that there is no evidence, for it was all broadcast live on state TV. "People should not be so persistent about some matters. For example we see a lot of people ranting on about the soaring price of chicken. Now so what if people don't eat chicken?" and he goes on to justify this by saying "all doctors agree that eating meat products is bad for your health." The soaring price of chicken which has trebled since the beginning of the Iranian New Year in March, has become a national obsession, even more important to ordinary people than the fluctuating gold and foreign currency prices. Pictures of ordinary people queuing to get the cheaper 'state chicken', occasionally handed out in the streets, is yet another chapter in humiliation of the people of Iran, a rich country which should have been a prosperous place to live for all. People juxtapose their own misery of queuing up for state chickens with that of foreign guests having lavish lunches in "Islamic Awakening" conferences. The soaring price of chicken is also nothing to do with sanctions, it is pure mismanagement of the economy which has resulted in closure of many hen farms, thus shortening the supplies. Apart from idolatry, which is one of the biggest superstitions, several more superstitions have come about and exist today. Even in today's age of progress and civilisation, strange superstitions have been propagated by the Europeans and the Americans. One of these new superstitions is the superstition of Holocaust. Those who believe in this superstition claim "The criminal Hitler burned six million Jews in the gas chambers and everyone must believe in this story and if they don;t they should be imprisoned. Interestingly many people in American and in Europe have accepted this great lie but we must tell them this is illogical and far removed from reason. Of course a historic issue must be studied and researched. If Hitler has committed such a crime, he should be condemned and if this was not the case and the Zionist have created this big lie to make themselves look like victimes and solicit sympathy for themselves, then they should be condemned. What logic dictates that anyone who researches the issue should go to jail? Is this issue so special amongst all others that talking about it must be banned and everyone should simply accept it by force? There is so much more archaic stuff about women, apostasy, dogs and how to deal with the infidel West on his website and in his books. Ayatollah Makarem Shirazi was also the first Iranian Grand Ayatollah who issued a fatwa and explicitly referred to the Iranian rapper, Shahin Najafi, who lives in Germany, to be killed for apostasy because of the lyrics Najafi used in one of his songs. But it gets better. 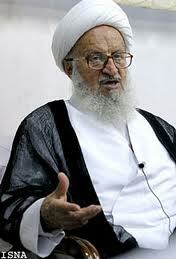 Ayatollah Makarem Shirazi, also has his representative office here in UK, in Harrow Road, known as Babul Murad Centre. He also has a registered charity in UK and wait for this one..........He has received a grant from Brent Council for helping with "Religious Freedom and Tolerance" :)))))) Ignorant and lunatic political correctness which is helping to bring down UK to its knees. Labels: makrem shirazi + so what if people cant eat chicken? Yeah right... Nobody wants bloodshed, but it really is about time Iranians had another Revolution! Just as it's about time the West as a whole got it's act together by properly shutting down these P.C. redtape loop holes that allows the Iranian Regime to set up duff organizations, financial bodies to handle their embezzled funds, and luxury holidays abroad for their friends and families!